Light echoes around a neutron star have allowed a precise distance to be determined to it. These light echoes are produced when a burst of X-rays bounces off of clouds. Determining distances in astronomy is notoriously difficult so objects like this are valuable. The new distance measurement to Circinus X-1 is over twice that of one previously published value. Data from NASA's Chandra X-ray Observatory has helped provide a rare opportunity to determine the distance to an object on the other side of the Milky Way galaxy, as described in our latest press release. The object is Circinus X-1, containing a neutron star - the collapsed core left behind after a star exploded - in orbit with a massive star. The Chandra data reveal a set of four rings that appear as circles around Circinus X-1. 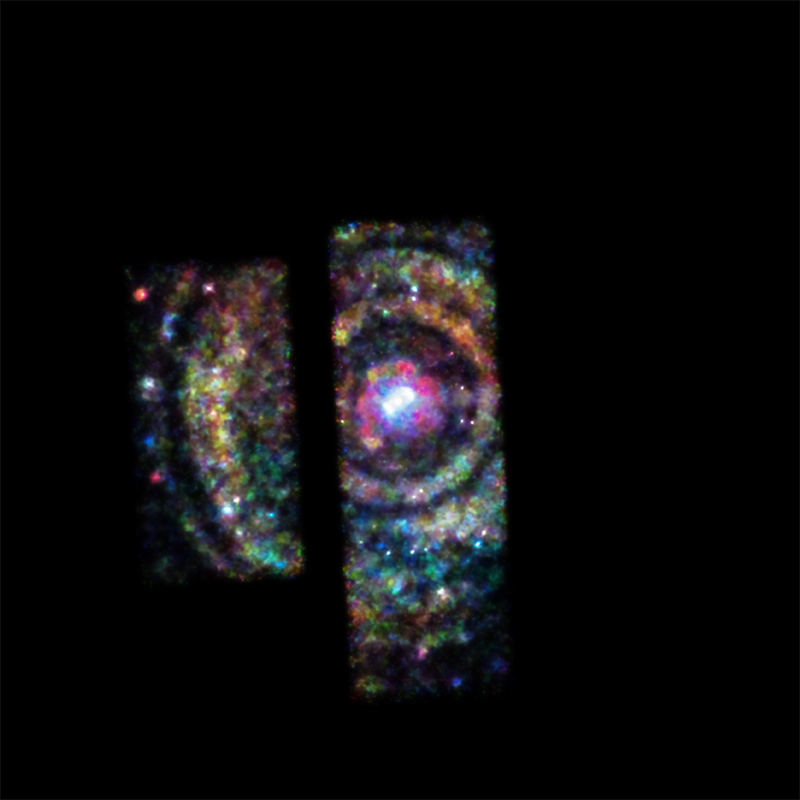 These rings can be seen in the composite image where X-rays from Chandra are red, green, and blue corresponding to low, medium, and high-energy X-rays respectively, which have been combined with a view in visible light from the Digitized Sky Survey. The sharp edges are caused by the large size of the X-ray rings compared to the relatively small field-of-view of the Chandra detectors, providing only partial coverage. What are these rings and what information do they provide? These rings are light echoes, similar to sound echoes that we may experience here on Earth. Instead of sound waves bouncing off a canyon wall, the echoes around Circinus X-1 are produced when a burst of X-rays from the star system ricochet off of clouds of dust between Circinus X-1 and Earth. 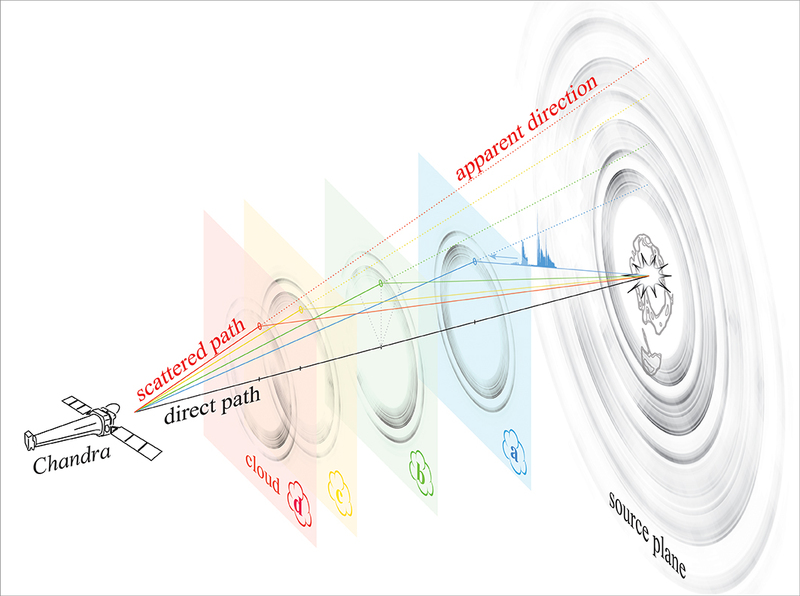 This artist's illustration shows in detail how the ringed structure seen by Chandra is produced. Each ring is caused by X-rays from the Circinus X-1 flare bouncing off of different dust clouds. If the cloud is closer to us, the ring appears to be larger. The result, as seen by Chandra, is a set of concentric rings with different apparent sizes depending on the distance of the intervening cloud from us. The physical sizes of the rings, using the labels given the illustration, are 41 light years (ring a), 49 light years (ring b), 55 light years (ring c), and 52 light years (ring d). By combining the light echoes that Chandra detects with radio data from the Mopra radio telescope in Australia, which determined the distance to the intervening clouds, astronomers can estimate the distance to Circinus X-1 using relatively simple geometry. The light echo method generates a distance of 30,700 light years. The observation thus settles a large difference amongst previous results, one similar to this work and one indicating a much smaller distance of about 13,000 light years. Such a difference in distance estimate to Circinus X-1 would have implications for other properties that have been observed before in the system. For example, if it is over twice as far away as some have previously thought, then this means its light output is much greater. (Consider a light bulb that is moved farther away, it will appear dimmer.) 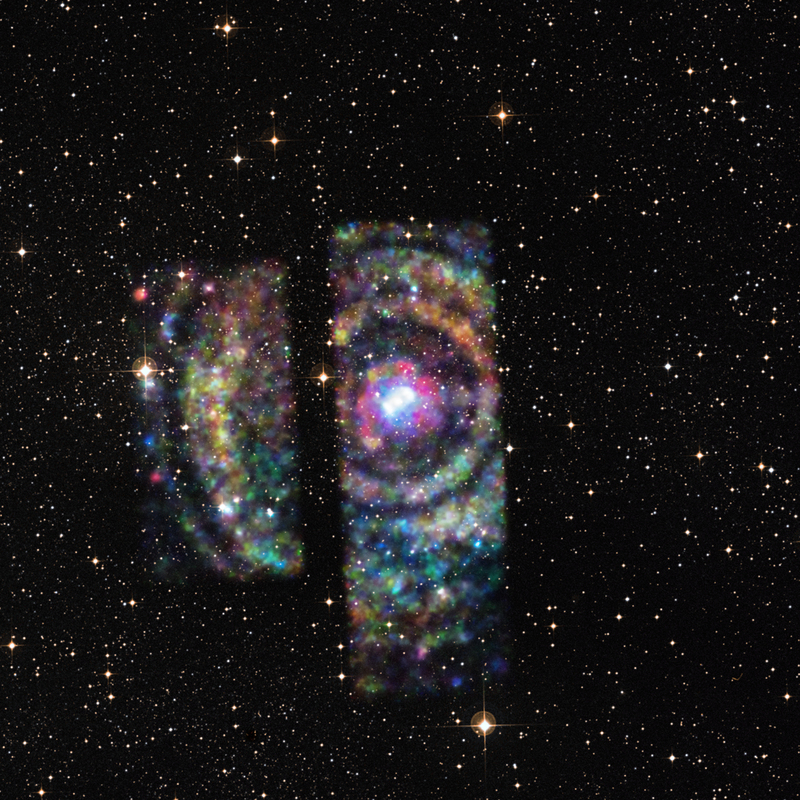 Because Circinus X-1 has been known to flare strongly in X-ray light, including an outburst in 2013, this implies that the system has exceeded the so-called Eddington Limit. This threshold, which is the balance between the inward pull of gravity and the outward push of radiation from an object, is generally only exceeded by systems containing black holes, not neutron stars. The researchers also determined that the speed of the jet of high-energy particles produced by the system is at least 99.9% of the speed of light. This extreme velocity is usually associated with jets produced by a black hole. These results appear in an upcoming issue of The Astrophysical Journal and are available online. NASA's Marshall Space Flight Center in Huntsville, Alabama, manages the Chandra program for the agency's Science Mission Directorate in Washington. The Smithsonian Astrophysical Observatory in Cambridge, Massachusetts, controls Chandra's science and flight operations. Coordinates (J2000) RA 15h 20m 41.00s | Dec -51° 10´ 00"
Observation Time 50 hours (2 days 2 hours). Thank you for a fascinating article. I remember this very star when its was the subject of an article back in the 80's sure its this one although back then they were describing it as a black hole given the amount of X-ray emissions. I was slightly confused with the rings and the description. Are you referring to gravitational lensing? In any case, a great article and I look forward to more on this particular system. A system with a neutron star in orbit with a massive star about 30,700 light years from Earth. About 300 light years across. X-rays are red, green and blue and optical are gold.